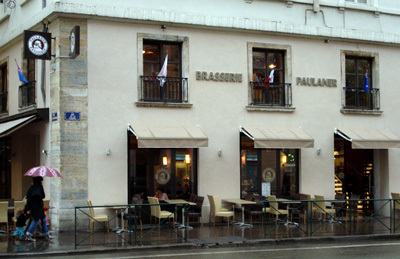 The Brasserie Paulaner is located in the heart of Lyon. It has just been redecorated going from a traditional French bistro style to something clean and modern. The restaurant is comfortable but a bit noisy because of the bar. While you probably can get some food in the evening, it’s really a lunch place. The service was very good. We were taken care of by the manager who not only speaks English but has a kind of funny wicked sense of humor. 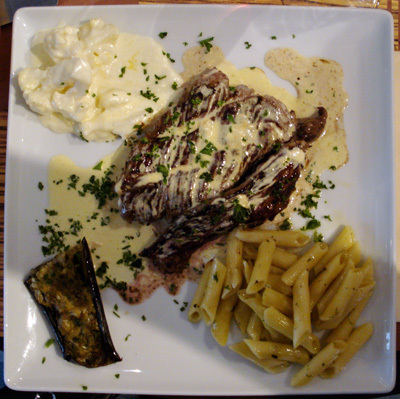 As main course I had a bavette (flap steak) with a Saint-Marcellin cheese sauce, a typical dish from Lyon. The bavette was served with cauliflower gratin, penne and stuffed eggplant. While the meat was very tasty, it was a bit too though. The Saint-Marcellin sauce and the vegetables were excellent. 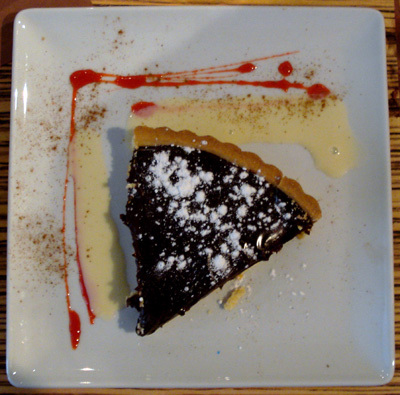 As desert, I had the chocolate tart. The tart was excellent. The pastry was just right, crumbling but not totally falling apart. The chocolate had nice smooth texture and a strong but not overpowering flavor. Around $35, including drinks (red wine, espresso) and tip. If you consider the food, the restaurant and the current strength of the euro, the Brasserie Paulaner offers excellent value for money. I will definitely come back.